Women's Original Tour Tall Rain Boots is rated 4.4 out of 5 by 39. Fabriquée à la main à partir d'un caoutchouc léger, pliable et imperméable, la botte montante Original Wellington Tour est idéale pour les festivals et les week-ends. La botte est une interprétation innovante de la célèbre botte montante Original de 1956. La jambe de la botte se plie, s'enroulant autour du pied pour faciliter l'emballage et le transport. Le caoutchouc souple permet de plier et d'emballer ces bottes. 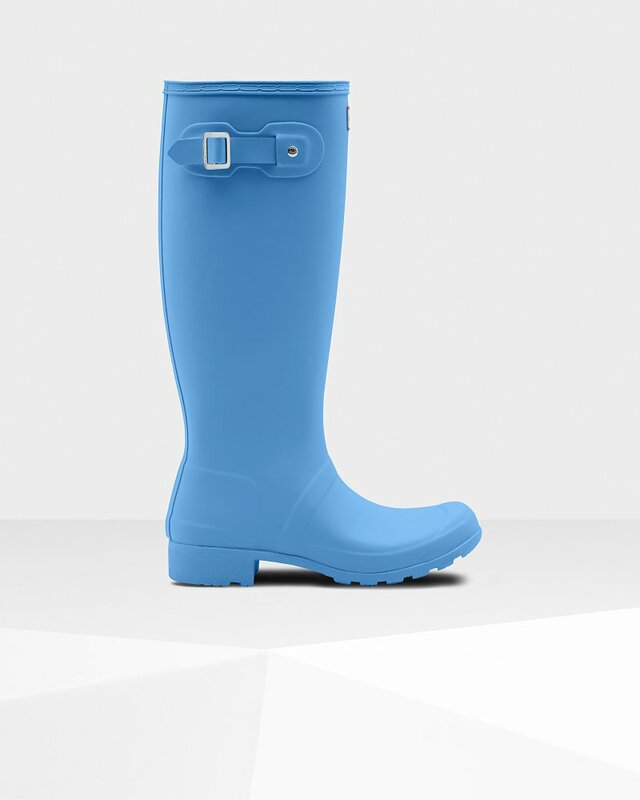 Rated 5 out of 5 by Len S. from The best rain boots! I have the original hunter and the tour boots are by far the best rain boots for me because it feels like im not wearing rain boots at all, soo lightweight— feels like walking on air, packable, easy to put on, not bulky, and overall a good investment. I can’t get enough of it and I wish I can buy it in all colors! The only downside for me is the color ( It doesnt come in gray/charcoal, my favorite shade). Rated 5 out of 5 by 604candy from Like the boots, comfortable to walk a long distanc I had two pairs of Hunter boots already , but I need aother pair for walking, so I order these packable boots . I have been wearing in the past few days and ther are just what I expected. Rated 5 out of 5 by Cheryl333 from Great Boot Boot is super. Great value for your feet and all season. Rated 5 out of 5 by Angel Marie from Love! I own both the original tall boot and now the touring tall boot. With the original boot, I couldn't go more than a couple hours wearing them without them starting to become too heavy and I was getting far too hot. Dont get me wrong, I love the boot, but they aren't good for all day wear. The touring boot is extremely lightweight and I can and have worn them all day, feeling like I'm not even wearing a boot at all! The quality is terrific and the still keep my feet warm and protected - just like the original. I can see myself wearing the touring boot far more often though. Rated 5 out of 5 by Sweetmommy from Great fit! I use them in the slush and snow and they work verry well! Rated 5 out of 5 by Sab7 from So comfortable! I got these a few weeks ago and I’ve been so impressed at how comfortable and easy to walk in they are!